Homeless people seen at a bus stop after receiving food handed out by employees of the Spravedlivaya Pomosch ('Just Aid') Fund. Many believe it’s impossible to escape homelessness, and that once you end up on the streets it’s nearly impossible to return to a normal life. One woman, 25-year old Irina, recalls how she returned to a better life after seven desperate years living on Moscow’s mean streets. I was born in Moscow and when I was 14 years old I ran away from home. There was a good reason for that; my stepfather beat me regularly. When he broke two of my ribs, I understood that I’d not be able to handle it next time. So, I left and joined a group of vagrants who lived near the Kurskyaya Railway Station. This was one large community where everyone helped each other with anything they could. We slept in the train station - some under the platform, some on the street, and some in the waiting room if they were lucky. Often the police chased us away, and sometimes we would run from them the whole day. Another big problem were the young thugs, who beat or jeered at the homeless. Sometimes they were very cruel, and they would even light sleeping vagabonds on fire. The community kept us alive, however. We stuck together and protected each other. Frost has always been the worst enemy of the homeless, and we often slept five or even ten people on one mattress, covering ourselves with the blankets that we managed to find. We got warm with vodka, but we didn't always have enough money for it, and so we often drank medical alcohol. We'd buy all kinds of tinctures in pharmacies, and even sometimes drink the surrogate alcohol hawthorn-scented bath essence known as Boyaryshnik in Russian. A homeless person doesn’t have many joys in life, and many people in my group began to look for happiness in drugs. As strange as it sounds, they began with heroin even though it’s very expensive, and then they graduated to cheap medicines with narcotic effects. Obviously, where there are drugs, there is thievery, and whoever was addicted to this crap for long eventually began to steal whatever they could, even from friends. As far as clothes and washing, in the summer we'd go to the Kuskovo Park or to a river. There, we'd swim and wash our clothes. Then a public bath was opened in Kurskaya Station for the homeless where you could go in winter. Also, more and more charity organizations appeared, giving free food to vagrants. This was a big help because when I had started wandering the streets it was more difficult with food. Some people would even eat pigeons and stray dogs, although I never did this. That’s disgusting. The dogs in general would be of great help. Some vagabonds fed them really well and would later sit with them in underground crossings and beg for money. In total, I wandered the streets for seven years. It's difficult to say how and why I decided to change my life. I just got tired of it, I guess. A big factor was that many of my friends either died from drugs or ended up in jail because of them. Staff from the Charity Group helped me out. I was often coming to their center and lived there for some time. They helped me get a state personal identity card, known as an internal passport in Russia, and find special training courses. Soon, I got a job as a cashier in a grocery shop. Now, I work as a salesperson and rent an apartment. I still haven’t spoken to my relatives, but practically none of them are still alive. Sometimes I see my former vagabond friends from the Kurskaya Station and try to help them. But often there is nothing that can be done because they don’t want to change their lives. They like to beg and drink vodka. They know how to survive, and they don’t know any other life and are afraid of change. You can give them money, clothes and whatever, but they’ll remain on the streets and will continue drinking. 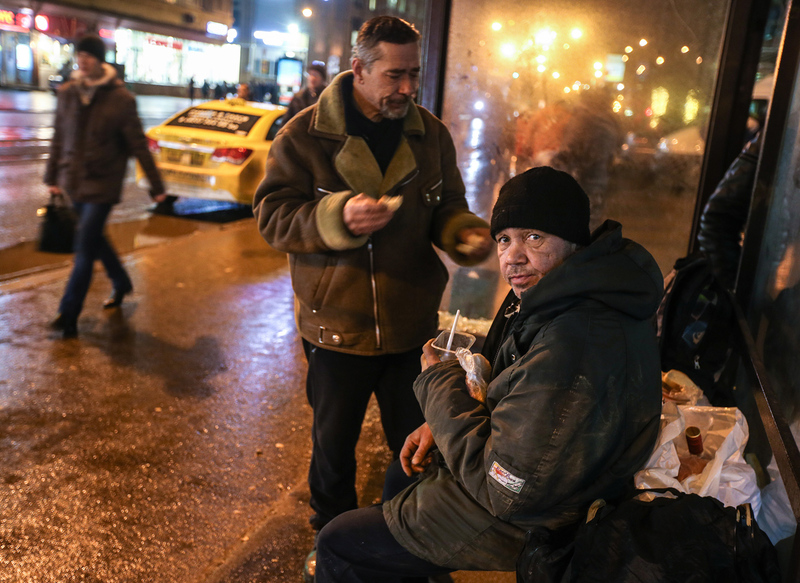 Natalya Markova, coordinator of the Friends on the Street Charity Movement, said there is no exact data on how many homeless people live in Moscow. "In 2012, the Department of Social Protection of the Moscow Population conducted a study that concluded there was almost 6,000 homeless people in the city, but we still don't have more recent information," said Markova. According to various experts, in total there are anywhere from 30,000 to 100,000 homeless people in Russia.